The art of adornment is a unique nature of man. The material used always changed in time, from flowers to shells and bone, from ivory to, silver, gems and gold. It always changed based on the cultural elevation of the mankind. India being a “Gem-Bearing” country has always been a treasure of trove for travellers, traders as well as invaders. 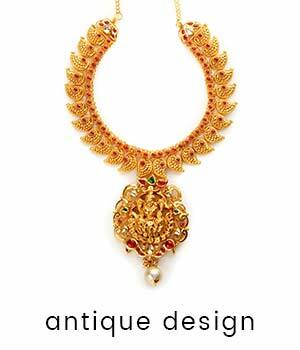 Indian jewellery with a history of over 5000 years, has never remained just as a craft, it evolved into an art. The Indian love of jewellery means a love of beauty and aesthetic. In many antique designs, you can see an artist’s aspirations reaching its perfection. And it always conquered millions of mind! A typical Malayalee bride is adorned brightly with bridal jewellery from head to toe. We present some of the unique and traditional jewellery designs in Kerala. This traditional South Indian ornament is worn by brides and classical dancers to decorate their hair. Jadanagam is decorated in the kundan technique in which hundreds of Rubies, Emeralds, Amethysts and pieces of Rock crystal were inset into malleable gold foil and made flush with the surface of the ornament. Jhimkis: It is a bell-shaped designer earring. 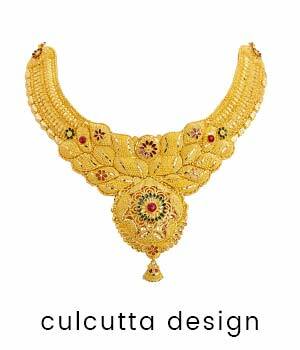 This traditional Kerala jewellery pattern generally was worn by the brides in Kerala . It is seen as a part of temple jewellery. While one particular design of a jhimki is all about ear studs in palakka (leaf), another type of jhimki is a gold-plated earring that has small dangling bells. Thoda: It is another pattern of earring which is quite popular in Malabar area. Jhumkas: This ornament is an eternal favourite design earrings that are in vogue since years for a gorgeous look than can harmonize with any occasion. Plenty of designs are available in Jhumkas. Jadau: Jadau is simply a way of using Kundan, Polki & Meenakari ornaments in an engraved setting. Gold foil is used to set Polki stones with meenakari at the back. Mukhuttis (nose rings) The origin of Mukhutti or nose-ring is from Maharashtra. There it is known as Nath. This exquisite ornament is of diamonds set in flower-shaped clusters of pearls. There is a different type of nose ornaments available. However, one of the most elegant is Nath of Maharashtra. Nose ornaments have been of different types and it has different names in different parts of India. In north India, it is known as Latkan or Laung while in western India it is known as Nathni. The Mughal emperors were lovers of precious stones. The Timurids, ancestors of the Mughals, had begun the tradition of engraving titles and names on stones of outstanding quality and, along with diamonds and emeralds, large spinel beads were their favorite. These gems were a symbol of the opulence and dignity of the empire. Emeralds were enormously popular in the Mughal era . Kundan necklaces are essentially glass based ones. It can be precious or semi-precious depending on the stone used. It’s polished to make it look more intricate. It’s more to do with setting gemstones in gold jewellery. All the regional flavours are machine cut design in shine finish. Some designs are famous for their intricate filigree work while some are innovative and intricate craftsmanship. The popular designs are Calcutta, Rajkot, Turkey, Bombay and Singapore. Uncut Stones: The uncut stones (diamond, ruby, and emerald), is a stone that has not been shaped in any particular form by a professional cutter and has not undergone any polishing. Uncut diamonds are also referred to as rough diamonds (or raw diamonds). It is comparatively cheaper than the finished or cut ones. Uncut stones are widely using in the antique jewellery designs. Polki: Polki is made of unfinished natural diamonds - those that come in their natural shape and don’t need any polishing or finishing. Signity Cubic Zirconia: Popularly known as Signity stone, is an alternative to diamonds or it is imitated diamonds. These stone like substance is bright white with more sparkle than diamonds. It is widely using the jewellery making. Rudrakhsa Mala : Rudraksha is a seed traditionally used for prayer beads in Hinduism. The seed is using in the making of jewellery as well. Rakta Chandan Mala: or Red Sandalwood Rosary consists of beads of red sandalwood. Both sides of each bead is covered with gold is the nature of its design. Tulasi Mala: Tulasi represents Lord Krishna. Many religious minded people wear necklaces of Tulasi. Its’ design is both sides of each bead is covered with gold. Navarathnamala: Nine kinds of precious gemstones combined in one necklace. This ornament originated in South India. Vanki, also known as Aaram or armlet is inlaid with rose-cut diamonds, cabochon rubies, and emeralds. An effect of coiled snakes is seen in the gold work on either side in the lower part of Vanki. In the traditional Vanki design, two parts lead up to the top of it from which drops a typical lotus-motif pendant. Palakka Kada: Kada otherwise known as Karas or bracelets is originated from Varanasi. Thick bracelet with green, blue or red stones are known as Palakka and it is popular in the Malabar region. These bangles are worn on auspicious occasions. Dasavatharam: The bangle depicts all ten incarnations of Lord Vishnu. Hence, the name Dasavatharam. 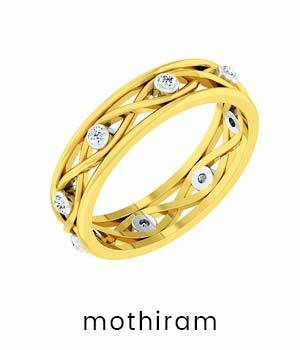 Ashtalakshmi: In this bangle, the eight forms Goddesses Lakshmi have depicted. Jadau Kada: In Jadau Kada, emerald, ruby and pearls are embedded in pure gold. It is a testimony to royal Indian heritage of great precision and artistry. This ornament has its origins in the Mughal times. It comprises of finger rings that are attached to an armlet. The connecting area usually contains designs of lotus, sun or moon. It is also known as Panchagala (jewel for the five fingers)or Hathphool. In Bengal it is known as ‘Ratnachur’. It consists of a Kundan-set flower-encrusted bracelet with a stone set chain leading to another flower on the back of the palm and similar chain connecting it to the five rings on the five fingers , each ring with a different flower motif. Payyannur Pavithra Kettu: It is a specially crafted golden ring, shaped like a knot and considered to be a sacred ornament. The sole right to make this holy ring was vested in the hands of a particular family at Payyannur in Kannur district. This ring is believed to bring luck to anyone who wears it with devotion. Vanki Ring: This ornament has also traditional importance. 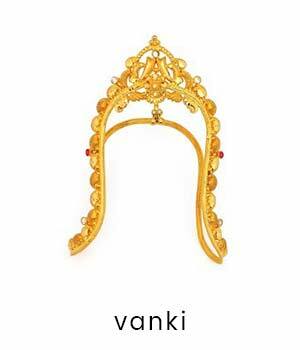 Vanki or Kanganam is commonly used to ward off evil lucks. It has its own significance in Vedic terms. It is very unique because of its inverted V-shaped design. Anaval Mothiram : Two or three elephant hair wire are using to make this rings The elephant hair is fixed on the ring or in between the gold ring. Rosary Ring. It is a unique invention, with ten small beads allowing us to roll the ring around in our hand as you pray. It is believed that Rosary Ring originated in Ireland. Vatche Rings: These particular rings are popular for engagements. 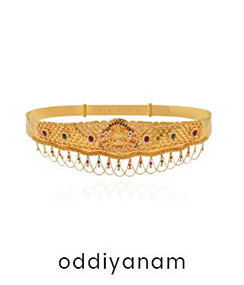 Handcrafted exclusive gold plated hip belts called as Kamarband or Oddiyanam. The ornament is carved intricately with Goddess Lakshmi imprints. This waist ornament of South India is encrusted with rose cut diamonds, emeralds, and cabochon rubies. Peacocks, flowers, buds and leaves intermingle in riotous profusion. This hip ornament or Waist belt with precious Ruby & Emerald stones studded on it. The pattern is exclusively designed floral and peacock designs. In Bengal it is known as Chadra Haar and this ornament’s design pattern is also different in the eastern India. It comprises of a series of chains made up of minute gold balls held in the criss-cross gold wire, leading down to an elaborate filigree pendant with a floral motif. ‘Kolusu’ or Anklet is worn by girls and women on weddings and festive occasions. A kolusu makes a pleasant sound when the girl or the bride moves around. Traditionally, it is made of silver but it is also available in gold. The name of this ornament varies in different India states. It is also known as payal, gajra, sankla, chanjar, zanjiri, and kaappu.